'The Dispatch is the best country paper in the north of South Australia' claimed the publisher of the Port Augusta dispatch on 13 January 1905, p. 1. 'With the exception of the Adelaide dailies the Dispatch has the most extensive territorial circulation of any journal in the colony' was claimed a few years earlier (14 July 1899, p. 4). Certainly the huge number of settlements far and wide, large and small, covered in the columns of this newspaper - particularly in its early years -are impressive. The Port Augusta dispatch was founded in 1877 by a company headed by Thomas Burgoyne. Burgoyne was the Town Clerk of Port Augusta, as well as editor and manager of the newspaper. HJ White followed Burgoyne as editor for a time and between 1893 and 1895 John Waters Kirwan was editor. The printer of the Dispatch was David Drysdale, a young Victorian. Drysdale was to be connected with the Dispatch for almost 40 years. He was an experienced printer, having worked for various newspapers in Castlemaine and Melbourne before working at the Dispatch. In 1880 Drysdale became sole owner of the newspaper until 1910, when he sold to RL Abbott. Following Abbott's death, Drysdale re-purchased the newspaper in October 1915. Three months later the Dispatch was sold again, to Emrys Rhys-Jones and Sydney Dew, but it ceased shortly afterwards in February 1916. The Port Augusta dispatch was founded shortly after the incorporation of the town of Port Augusta in 1875. The young township was progressing in leaps and bounds, and the people wanted a newspaper. In particular, it was felt that a newspaper would help make the opinions of the people of the mid-north better known to the decision-makers in Adelaide. The columns of the Dispatch were full of the news of the multitude of tiny communities that spread around Port Augusta. An 'Adelaide letter' column also provided detailed news from the capital. Local sport in the form of cricket, chess and rifle shooting was reported. The newspaper's printer, Drysdale, rose to the rank of captain in the volunteer militia, and was a member of the local rifle club. Strangely, football does not seem to rate a mention until the early 1900s. As well as the farming community, the activities of the port were represented, in such reports as those describing the controversial wharf extensions in 1882, the call to build smelters in the town in 1898, and the behaviour of visiting sailors as represented in the court reports. For a brief period in 1901 a social column, 'Town gossip by Dolly Pertinax', appeared. The quality of the newspaper fell in the decades before its demise, although for the short period that Drysdale re-purchased the Dispatch in 1915, various improvements were made. An interesting supplement was published with the issue of 28 October 1892. 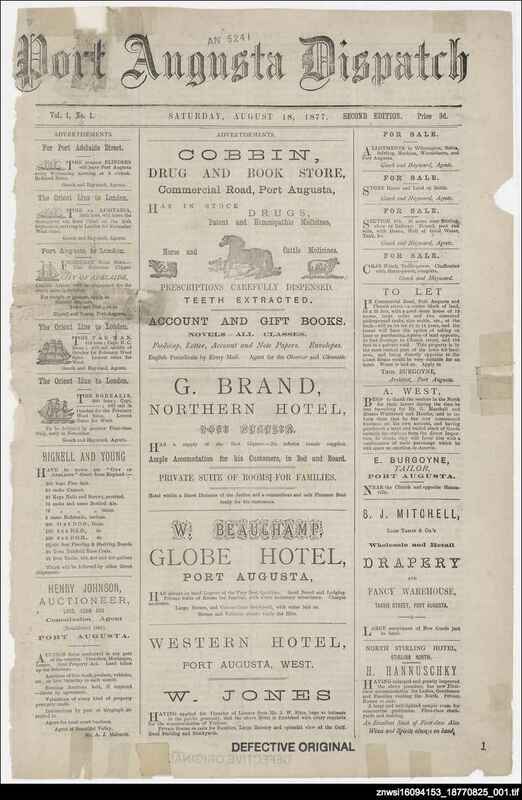 This issue included a double-page coloured lithographic supplement depicting scenes in and around Port Augusta, prepared by Rider and Mercer of Ballarat, Victoria.